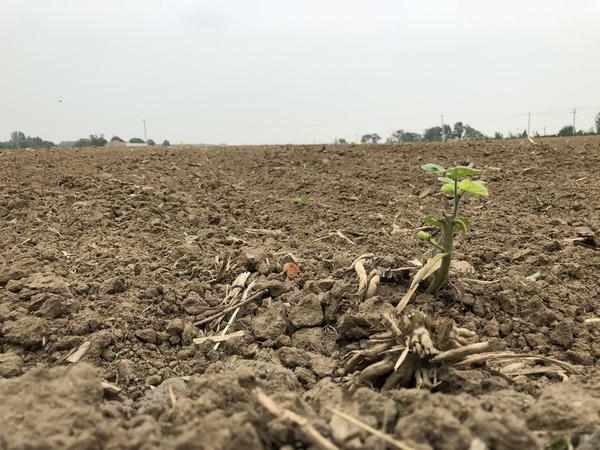 A single soybean plant grows in a field in the village of Sandaogou, China. 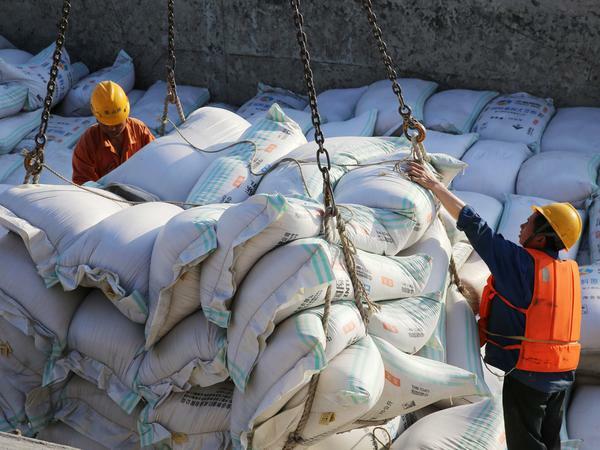 Workers transfer bags of soybean meal at a port in Nantong in China's eastern Jiangsu province. China is the world's largest consumer of soybeans, a key product for making things like oil and pig feed, and is America's biggest buyer of the beans. But China has raised tariffs on a number of items including soybeans shipped from the U.S., in retaliation against new import duties on Chinese goods imposed by the Trump administration. On Monday, President Trump ordered his trade representative to draft a new list of $200 billion in Chinese goods for further tariffs, in a sharp escalation of the trade fight between the world's top two economies. In May, China's agriculture ministry said the country will reduce its soybean imports for the first time in 15 years. To make up for part of the loss, the central government ordered local authorities to set aside 1.6 million acres of land to grow more soybeans. The country already cultivates nearly 21 million acres of the crop. "It's too risky to grow soybeans, and the income is less stable than growing corn," says Liu. "You don't lose money growing corn. Soybean yields are too low." "None of us wants a trade war," says Si Wei, an expert in the soy trade at China Agricultural University. "But if it happens, we need to think about what's important." "Judging from the land and water resources we have, I don't think it's realistic to grow all the soybeans we need ourselves and completely replace U.S. imports. We use U.S. soybeans mostly for oil. We'd have to replace it with peanut and rapeseed oil," he says. Si says China can import those oils from Australia, Canada and Central Europe instead, but it won't be an easy transition for China. Back on the soybean farm in Three Ditches village, farmer Liu says she hasn't heard about the trade spat between the U.S. and China. She unplugged her television months ago so that her son would focus on his studies. She adds: "If they give me a better subsidy and provide sales channels for me, then why not?" There are more threats of tariffs from the Trump administration on goods from China. If you're keeping track at home, that's up to $250 billion. In addition to last week's announcement in tariffs on $50 billion worth of Chinese imports, yesterday the administration threatened tariffs on another $200 billion worth of Chinese imports. Beijing has promised to match the U.S. response. And on China's list of tariffs - U.S. soybeans. This has American farmers worried because half of all soybeans grown in the U.S. are exported to China. As NPR's Rob Schmitz reports, China's government has asked its own farmers to grow more soybeans to prepare. ROB SCHMITZ, BYLINE: The order came in April. China's government instructed farmers in the country's northeastern breadbasket region to grow more soybeans, labeling it, quote, "a political priority." But soybean fields lay empty here in the village of Sandaogou, English name Three Ditches, in Liaoning province. It's been a dry spring. LIU: (Through interpreter) We've had a drought this year, so we planted soybeans late. The seedlings should be out by now. We need more rain. SCHMITZ: Farmer Liu only gives her surname for fear of trouble with local authorities. Soybeans, as the government edict announced, have become political. China's central government has ordered local authorities to set aside 1.6 million acres of land to grow more soybeans. But here in Three Ditches, farmer Liu would prefer not to. She only grows soybeans because the farming collective she belongs to makes her. On the plots of land she farms for herself, she grows corn. LIU: (Through interpreter) It's too risky to grow soybeans, and the income is less stable than growing corn. You don't lose money growing corn. Soybean yields are too low. SCHMITZ: And government subsidies, says Liu, aren't enough incentive to grow soybeans. China produced 14 million tons of soybeans last year, and it imported nearly 100 million more tons to meet domestic demand. A third of those imports were from the U.S.
SI WEI: (Through interpreter) None of us wants a trade war, but if it happens, we need to think about what's important. SCHMITZ: China Agricultural University's Si Wei specializes in soybean trade. Si says Chinese tariffs on imported soybeans will have a big impact on both the U.S. and China markets. SI: (Through interpreter) Judging from the land and water resources we have, I don't think it's realistic to grow all the soybeans we need ourselves and completely replace U.S. imports. We use U.S. soybeans mostly for oil. We'd have to replace it with peanut and rapeseed oil. SCHMITZ: Si says China can import those oils from Australia, Canada and Central Europe instead, but it won't be an easy transition for China. Back on the soybean farm in Three Ditches Village, farmer Liu says she hasn't heard about the trade spat between the U.S. and China. She unplugged her television months ago so that her son will focus on his studies. But if the government asked her to grow more soybeans, she said she would if the money were right. LIU: (Through interpreter) If they give me a better subsidy and provide sales channels for me, then why not? SCHMITZ: Chinese farmers, says Liu, are willing to grow whatever guarantees more money. Rob Schmitz, NPR News, Three Ditches Village, China. Transcript provided by NPR, Copyright NPR.